Root canals are needed when the pulp of a tooth becomes infected or inflamed. You can use your Careington Care 500 plan for this procedure. Dentist or endodontist (dental specialist) examines and takes x-rays of the infected tooth. Patient returns for a second visit where the dentist places the crown onto the corrected tooth and does any other restoration on the tooth to protect it..
Disclaimer: Some teeth do not need a crown after a root canal. Talk to your dentist about your treatment plan. 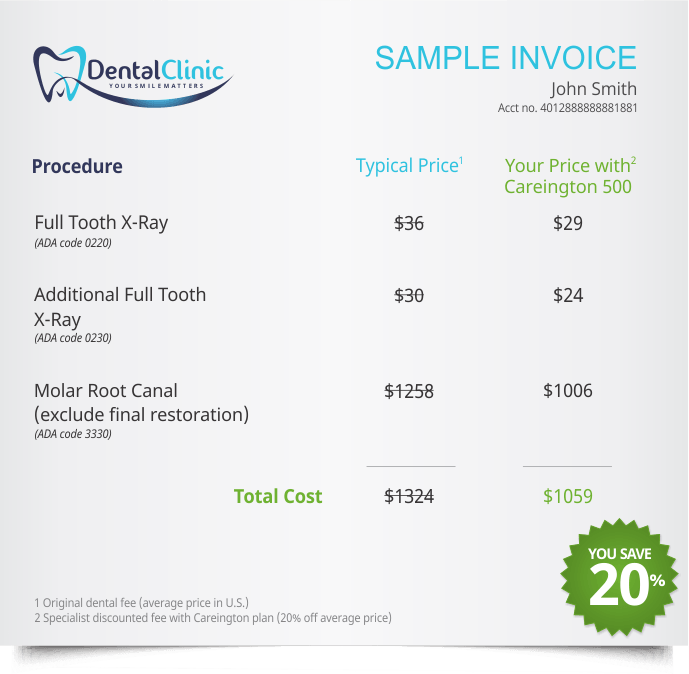 Below is a sample dental bill for a patient who had one root canal and used the Careington Care 500 plan. This patient saw a specialist. You will see the bill listed below, and directly following we have also included a sample bill for a general dentist performing the same procedure since some general dentists will do the root canal themselves. In this case, two x-rays were needed to examine the infected tooth, which was in the back of the mouth. There are times that general dentists will refer their patients to a specialist if the treatment is going to be more difficult or time-consuming to perform, like a root canal in the back of the mouth. 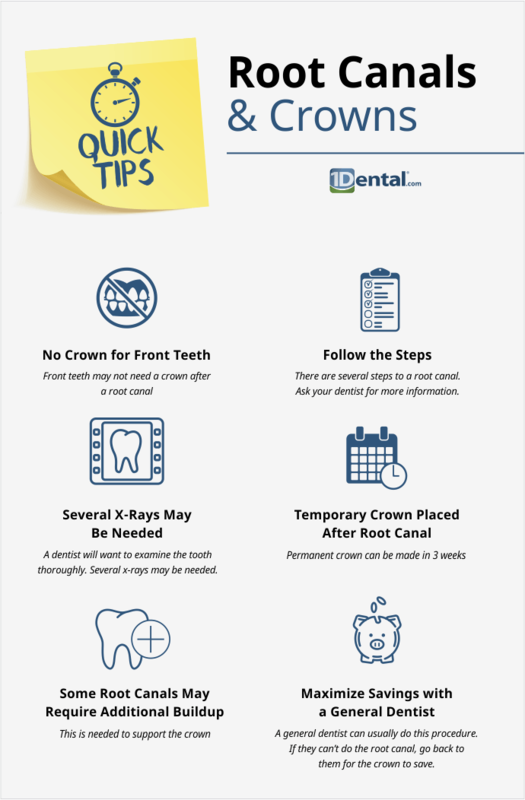 If a crown is needed after the procedure, your dentist will place a temporary crown on the infected tooth until a permanent crown can be made, which usually takes about 3 weeks. Once the crown has been received, you will return for the final restoration of your tooth and get the permanent crown. Below is the dental bill for the second visit. In this case, a white crown (resin-based composite) was used and core buildup was needed. These additional materials might be needed if the tooth has so much decay that there isn’t enough support for the crown after the pulp is removed and supplemental support is needed, or if the dentist is charged by a third-party dental laboratory for producing the dental crown. Your dentist may or may not be charged by the dental lab for making the crown. If they are, lab fees can be anywhere between $100-$250. This cost will be passed to the patient. These prices are not discounted because it is a third-party expense. 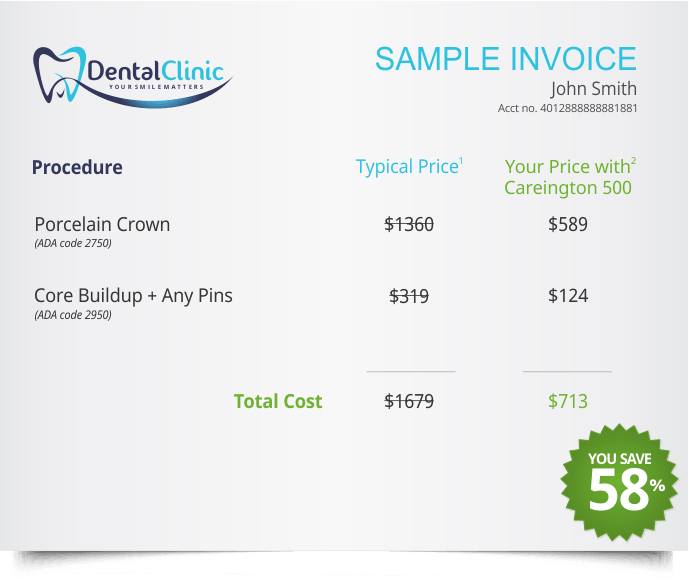 If you need a crown, ask your dentist if you will incur the cost of the crown being made and how much that will cost so you are informed beforehand. Find out more about the different types of crowns you may have to choose from. Root Canal - What Is It and Why Does My Tooth Hurt?